NEW 16GB DDR3 RAM. SSD HARDRIVE ARE AVAILABLE. HIGH SPEC GAMING TOWERS. FAST CHEAP GAMING TOWERS. GEFORCE NVidia 4GB GTX1050. Super Ultra Fast Latest. DVI-D OR HDMI OR VGA. 1x Gaming PC. NEW 16GB DDR3 RAM. HIGH SPEC GAMING TOWERS. FAST CHEAP GAMING TOWERS. GEFORCE NVidia 4GB GTX1050. Super Ultra Fast Latest. 1x Gaming PC. AJComputers hand pick the correct motherboard to fit your gaming specification. Architecture: 64-bit -Installed: 4GB. PAQCA office software built-in windows 7 windows 8 or 10 windows to choose antivirus with free upgrade for 12 months. -Speed: 1,6 GHz. Sistema operativo Windows 10. NEW 16GB DDR3 RAM. HIGH SPEC GAMING TOWERS. FAST CHEAP GAMING TOWERS. RED DEVIL GAMING CASE. GEFORCE NVidia 4GB GTX1050. Super Ultra Fast Latest. 1x Gaming PC. AJComputers hand pick the correct motherboard to fit your gaming specification. 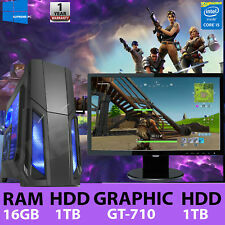 Item Description Operating System Windows 10 Home Premium 64-bit Processor Intel Core i7 2600 @ 3.40Ghz Ram 16GB DDR3 Hard Drive 1TB Sata Hard Disk Drive Optical Drive Optical Drive Graphic Card 4GB Nvidia GTX 1050Ti HDMI WIFI USB-WiFi Power Cable 3-Pin Computer Power Lead Software Included Windows Defender, CCleaner, Speccy, Open Office, Team Viewer, VLC Player, Chrome and Fully Activated Windows WHAT WILL COME IN THE BUNDLE: 1x Gaming PC 1x Desktop PC power lead. Rodzaj obudowy: Ultra SFF Small Form Factor. Typ zasilacza: Zewnętrzny. System operacyjny: Brak. Komunikacja: Bluetooth, LAN (RJ-45), WiFi. Wyjścia/wejścia obrazu: HDMI. Wyjścia/wejścia dźwięku: Słuchawkowe/mikrofonowe (Combo). NUC BABY CANYON NUC7i5BNK HDMI/M-DP/USBGet ready for truly responsive performance. Room for up to 32 GB of DDR4 RAM lets you increase performance easily. NUC Kit NUC7i5BNK. Chassis type UCFF. Processor frequency 2.2 GHz. Manufacturer Part Number: BOXNUC7I5BNK. Product Model: NUC7i5BNK. Product Family: NUC. Product Line: NUC. Images shown are for demonstration purposes. Processor Type: Core i5. Processor Speed: 2.20 GHz. HP ProLiant ML110 G6. 250GB 7200 RPM SATA (If ordering an SSD the actual capacity may range. 128GB = 120GB to 128GB and 256GB = 240GB to 256GB and 512 GB = 480GB to 512GB). Windows 10 Pro. Professionally Reconditioned - All our computers go through intensive testing by Certified Technicians and professional software. Hard Drive: 2TB 7200 RPM Serial ATA hard drive. It is a complete Bundle(Tower Monitor). Processor Speed: 3.60GHz. Ethernet: 10/100/1000 Base-T Network. Renders all the visuals on screen with smooth, vivid quality. Exceptionally fast and responsive, easily overclocked for your maximum gaming experience. Processor model Pentium G3260T. with SSD which will provide ultra fast computing ability. hard drive capacity 250GB Solid State Drive. optical drive DVD-R; DVD R; DVD RW; DVD-RW; DVD-RAM; CD-R; CD-RW; DVD-ROM; Ultra Slim Tray SuperMulti DVD Burner. GPU: Gigabyte Geforce GTX 1050 OC Edition 3GB W/ Dual fans Direct X 12 Ready! Hello Guys! Hard Drive: WindGate 1TB HDD. RAM: 8GB PC4 2400Mhz 4GB x2 EVO SPEED Geil. 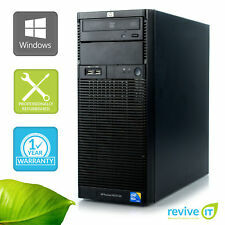 Dell Optiplex 390 Windows 7 Home Premium i3 3.3GHz 4GB. Condition is Used. Widows is set back to factory settings. Works fine and has only minor optical flaws. Comes with power and RGB cable. GeForce GTX1050 OC edition 2GB GDDR5. -8 GB of corsair vengeance ram. -MSI B360 gaming mother board. -Red dragon gaming k552-BA keyboard, mouse, and mouse pad. Computer Type: Dell OptiPlex 790. Model Number: OptiPlex 790. Processor Speed: 3.40 GHz. Hard Drive: 250 GB Hard drive installed. RAM: 4 GB-. Display Adapter: AMD Radeon HD 5450. DVD/CD-ROM Drive PLDS DVD RW DS-8A8SH ATA. Model Number BOXNUC6I7KYK. 2 260-pin DDR4 SODIMM. The NUC6I7KYK includes two lids: one blank and one with skull graphic. Includes 512GB M.2 Drive. 512GB M.2 SSD Installed. Storage 512GB M.2 Solid State Drive Installed. Dell Inspiron 620 1 TB, I5 3.30 GHz, 8 GB Only for sale until end of November! Inspiron 620 Warranty Only for sale until the end of November. After that, all incentive to sale is no longer there. had it set up with windows 10: ran through all aspects of features. all is functional and seamless. NVIDIA GeForce GTX 1060 Founders Edition 6GB. 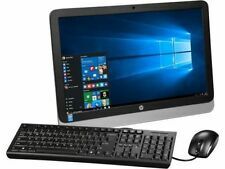 GAMING PC I7 USED VERY GOOD CONDITION like New. Asus ROG Maximus VIII Hero Z170 LGA 1151 DDR4 ATX Gaming Desktop PC Motherboar.